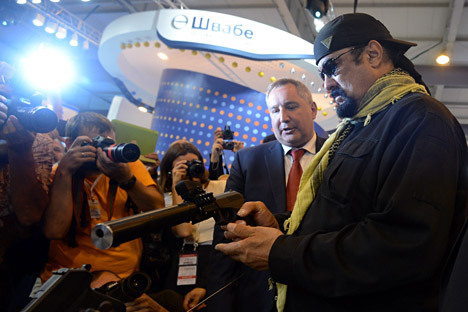 Russia's Deputy Prime Minister, chairman of the Russian Government's Military-Industrial Commission Dmitry Rogozin and famous American actor Steven Seagal with an SPS Serdyukov autoloading pistol with silencer, at the international exhibition "Oboronexpo-2014", during the 3rd International Forum "Machine-Building Technologies-2014" in Zhukovsky, Moscow Region. The SPS pistol, considered among the world’s best handguns, may soon be used by the Russian armed forces. A modified version of the “sort-of-classified,” soon-to-be inducted SPS, used by the Russian President’s bodyguards, is flexible and capable of penetrating body armour. The two standard-issue pistols used by the Russian military, the PM (the Makarov pistol) and MP-443 Grach, will soon be replaced by a new model developed by TsNIITochMash (Central Research Institute for Precision Engineering), according to a statement by the institute. The statement does not disclose which handgun will replace them, but details suggest it is a modified version of the SPS (the Serdyukov pistol), Russia's most deadly and ergonomic sidearm. Designed “from scratch” in Russia, the SPS is considered one of the best modern pistols in the world. The pistol, though not classified, is known only to weapons experts. The SPS (named after its designer) is used by Russia's Federal Guards Service, President Vladimir Putin's personal security force. Its agents are inseparable from the Russian leader and accompany him everywhere, on travels around the world. It is also used by the elite FSB and the Internal Ministry. The SPS has proven to be reliable under a very broad range of conditions, in temperatures from -58° to 122°F (-50°C to +50°C). The pistol is noted for its excellent accuracy even in the hands of an average shooter: a ten shot group measures 2½ inches at 27.3 yards (25 meters), and 12½ inches at 109 yards (100 meters). The SPS was developed in the 1990s – a very troubled period in Russian history – as a new sidearm for Russian military and police officers: The crime rate skyrocketed in the country during the decade, and many criminals had access to body armor, so there was a need for a pistol capable of penetrating it. And that it does: A shot from an SPS with 9x21 mm armor-piercing SP10 bullets, developed specifically for the pistol, can penetrate up to 30 layers of Kevlar augmented with either a titanium (up to 1.4 mm) or a steel (up to 4 mm) plate. The SPS is constantly being improved: in August 2012, TsNIITochMash presented the latest version of the pistol – the SR1MP, equipped with a Picatinny rail for mounting various accessories including reflector and laser sights, as well as tactical flashlights. The SR1MP can also be equipped with a suppressor. Though not yet adopted by the Russian army, the SPS — along with its various derivatives — is in production by the Mayak factory in Kirov (600 miles northeast of Moscow). The pistol is used by the elite forces of Russia’s FSB, Federal Guards Service and Internal Ministry.